Trying to trace the history of the first pizza is a surprisingly controversial subject. Some claim that this popular food is based on early unleavened breads served in the early centuries in Rome. 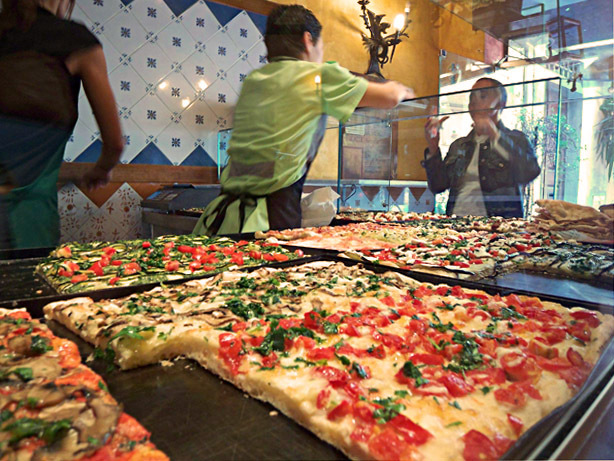 Others trace a connection from modern pizza back to the pita breads of Greece. It's fairly well established that the first pizza as we know it today was created by a man named Raffaele Esposito from Naples, Italy. Esposito's creation was designed to honor the visit of Queen Margherita to Naples in 1889, and he decorated it with the colors of the Italian flag, using white cheese, green basil, and red tomatoes (tomatoes, which had arrived from the west about 60 years earlier, were originally thought to be poisonous, but by Esposito's time they were already embraced by Italian cuisine). As the years passed and the turn of the century came about, Italian immigrants brought this recipe with them to America. The first pizzeria was opened in America in 1905. It remained popular almost exclusively among immigrants until the end of World War II, when American soldiers returned to their home soil and brought back a love of the pizza they had discovered overseas. With that, the pizza boom in America began and this food became a mainstream meal instead of an underground Italian snack. The concentration of Italian immigrants in New York in those olden days explains the fact that many people feel you must visit New York to get true pizzeria-style pizza. It's where the pizza got its American start, after all. And nobody who has experienced New York style pizza can disagree. New York is famous for its pizzerias, where a true slice of pizza consists of a thin, wide crust loaded with plenty of toppings and marinara and smothered in heady Italian seasonings. A side of garlic bread and some heady pastas and tortellinis usually round out the menu. Pizzerias in New York are not for the faint of heart. In the early 1940s, the city of Chicago, IL took pizza in a different direction. It is believed that the first pizzeria in Chicago was Pizzeria Uno, opened in 1943 by Ike Sewell. Sewell's pizza creation was a new twist on the old New York standard. He created what is known today as deep-dish pizza, where the pizza is sunk low into a deeper pan, and the crust is allowed to rise in thick bubbles around the edges. People flocked to Sewell's pizzeria, and a whole new way of looking at this favorite food was born. To this day you can find yourself in some pretty heated debates if you argue with a New Yorker or a Chicagoan about what constitutes authentic pizzeria-style pizza. But whatever crust style you choose, pizza is a unique food with a foggy past and a definite appeal that has lasted through many incarnations. So if you're lucky enough to find yourself in New York or Chicago, or any city for that matter that has a true pizzeria, complete with checked tablecloths and plenty of garlic on the menu, indulge yourself in an old tradition and order a slice.